So far Verizon has released 4 touchscreen phones: LG Voyager in Black and Titanium, LG Dare, and Samsung Glyde. 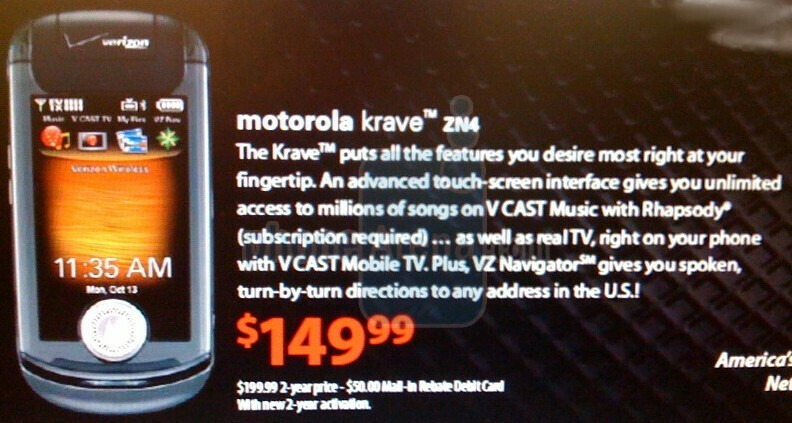 Now Motorola is the last to enter the Arena with the Krave ZN4, which we first heard about in July. It is Ming-styled, with a clear plastic flip over the touchscreen that houses the earpiece speaker. Other features include a 2MP camera, VCast Mobile TV (MediaFLO), HTML browser, EVDO Rev A, Bluetooth, microSDHC memory card slot, and a microUSB port. Pricing will be $149, after a $50 rebate with a 2-year contract. Meanwhile, the VU204 will be a basic flip phone, under the mid-level W755 and higher-end VU30, and will only have a standard VGA camera, 160x120 display, and Bluetooth. Pricing will be $29 after a $50 rebate with a 2-year contract, and will be be marketed as "Buy 1, Get 3 free". The actual release dates of both devices are unknown, but are expected to be out by the end of 2008. *UPDATE* The Krave ZN4 will be released on Oct 14th. Pricing is $149 (after $50 rebate) with a 2-year contract, $219 (after $50 rebate) with a 1-year contract, and $349 for those who have fear of commitment. It looks pretty average, but I will say this. I'm impressed by how far the VZW User Interface has come in terms of looks. That UI looks pretty nice, and when I compare it to the unbelievable dull UI on the RAZR V3m, it makes me want to give verizon a nice pat on the back. LMAO I remember that UI, it was horrible, the uhh .. bars on the top and bottom were permanently red. Jeez Louise, those were some horrid days. Why did VZW come out with that retarded UI in the first place? What was so wrong with what the manufactuers were using. Yeah the network is awsome but in some cases the phones have software issues! I keep hearing ppl complain about phones freezing and rebooting! C'mon back in the monochrome screen, no camera, tri-mode days we never had that problem. Its like we take one step forward and 2 steps back. Please get this software working right! Well, no matter what software is on the phone, its bound to have problems. The thing with the VZW UI is that it would make is easier for corporate store technicians to program or get to the underlying software of the phone. All phones would have similar programming menus, so that each technician wouldn't have to educate themselves on how to program each individual manufacturer menu. Verizon came out with the UI so when people had to switch from one phone to another due to manufacture defects... Moto 276, 265 etc to an LG or Samsung, they didnt have to call into CS to re-learn a new device. Problem was Moto was the only one who did not embrace this the UI. LG and Samsung had the Standard UI, then you had the ability to customize it with color or choose a completely different UI altogether. 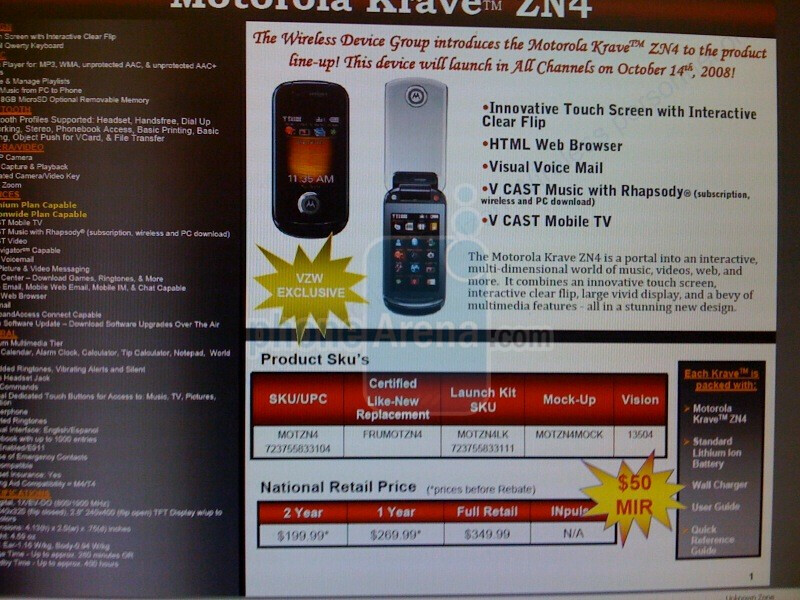 The RAZR was Moto putting the VZW UI over their current JAVA UI, which made is slow and you couldnt customize... including exterior screen wallpaper. W755 is a good replacement in terms of UI. 1. Initial programming is done OTA 2. Technicians don't do ANYTHING in store anymore. They plug the phone in and if the computer says there is a problem, they replace it. They have no clue how to actually fix a phone anymore. Technicians in certain regions of the country do still actually work on phones. Are trained and kept updated on the UI, manual programming, s/w fixes, and actually work on the phones by taking them apart! I don't know where the places are that have a 'computer' they plug it into that tells you if there's a problem or not, but I've never seen one of those. I've been to VZW stores all over the country in many regions and the Solectron (No...they're NOT employeed by Verizon Wireless) reps have told me they are not allowed to take the phones apart. They have equipment to attempt to troubleshoot the problems with phones, which basically means (simply worded by the poster above) that they hook it up to a computer and replace it if the computer says its bad. This is the in-store option for Verizon. The phones are then sent to a repair facility where people actually know what they are doing and fix (refurbish) the phones to trade out again. yea it does! i wonder how it will compare to other vz touchscreen phones? Not a big Moto fan (except for the Adventure V750). Can't possibly be any worse than the Glyde, in terms of touchscreen. I've talked to lots of customers that want touchscreen phones (just because they think they are cool, not because they really need html browsing or anything) but they need something durable. The cover over the screen is a good feature for people that would otherwise end up cracking the screen. As for the VU204, at least we will finally have something to replace the w385. Not that the w385 is a bad phone per se, but puh-lease, $119.99 on a new two year plan right now? When a Gleam is only $99.99? Motos are always so crazy overpriced. It'll be nice to have a (hopefully halfway) decent entry level Moto at a reasonable price. I'm drawn to the Krave its so quirky and unexpected the way its designed with a shield cover its pretty cool and im impressed. Especially how they wired the speaker into the shield without visually seeing any wires. My friend had a similar version from Europe/Asia... out of the USA (lol). Just like MKL4466, not a big moto fan but it IS an awesome design. I feel like that cover is just one more thing to break off. does it have an antenna? i hate the voyager's antenna, annoying. Internal antenna you retard. That's what they all do now that all service is digital. You're the retard. He was talking about the Voyager's retractable antenna for the MobileTV service. The Z6tv has an internal one, so my guess is the ZN4 will be the same. hey. does this phone look cool enough to get or should i get a blackberry curve?!?!?!?!? and by the way. 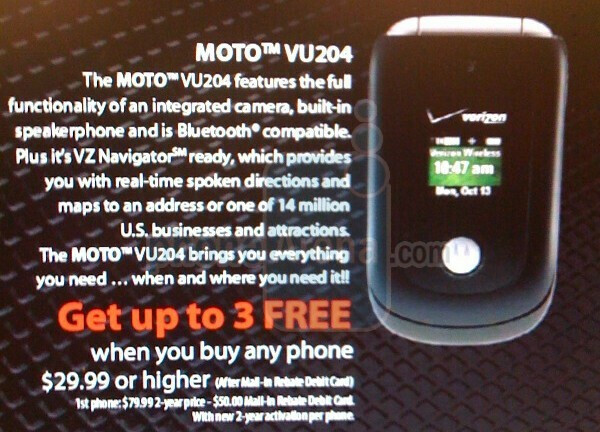 . . i really don't get why verizon couldn't just let the manufacturer do all the software and such!!!! but thats over and doe with now as we can clearly see that verizon is being a lot more lenient! please reply so i can know what phone to get on the 10th!!!!!! You are a liar. And Android has nothing to do with the phone. im sure the inventor of the android has better things to do then take questions of a cell phone forum.